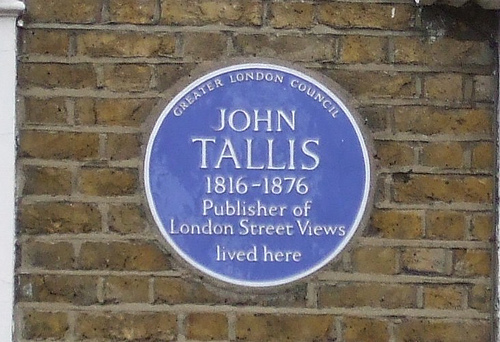 Tallis did not list the occupants of 309-317 Strand in the Street Views that came out in 1839. 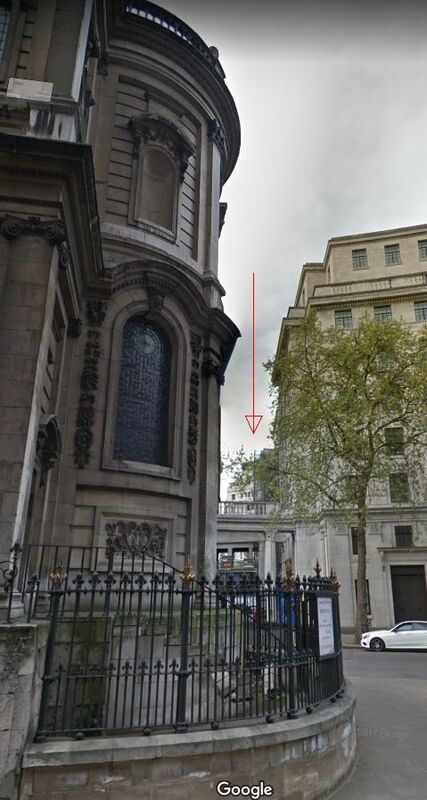 That section of the street was situated behind St. Mary-le-Strand and, for whatever reason, Tallis decided to depict the church rather than the shops behind it. You can just about see a small section of number 310 behind the church, but Peirce was not listed in the directory that came with the Street View. Tallis did make amends, however, in the 1847 Street Views and instead of the church he depicted the row of shops of which you can see number 310 at the top of this post. 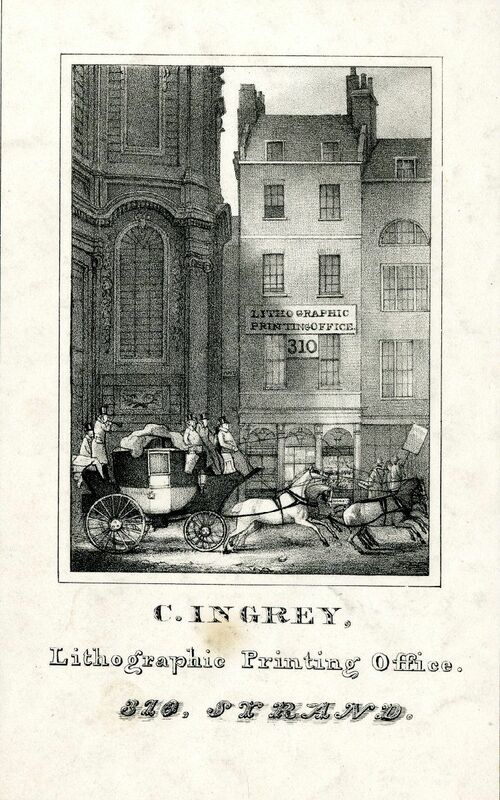 In March 1829, Charles Ingrey and George Edward Madeley, lithographic printers, at 310 Strand dissolved their partnership. (1) Ingrey left us a nice trade card that depicts his lithographic printing office. The British Museum date the card to somewhere between 1824 and 1839. The 1841 census tells us that James Randall, a collector of rents, and his family are occupying the premises, but so is George Peirce, printer, and his wife Susannah. 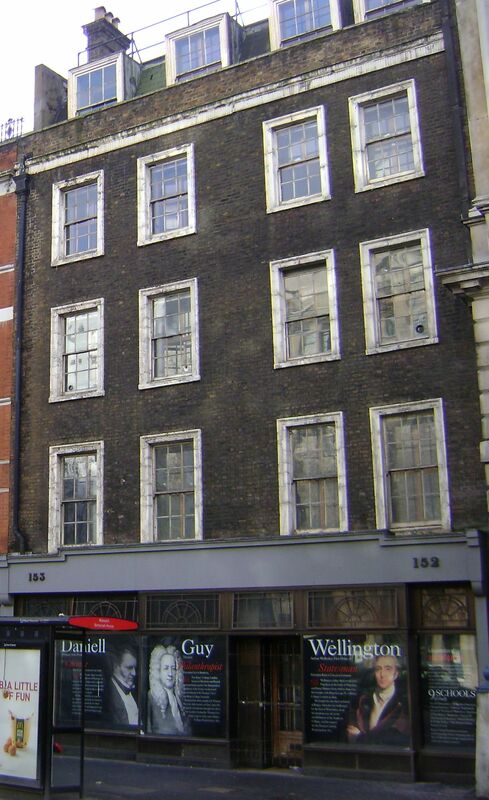 At some point in time George had entered into a partnership with one Matthew Flinders Pearson of 7 Castle Street, Holborn, also a printer, but that partnership was dissolved in late 1842. 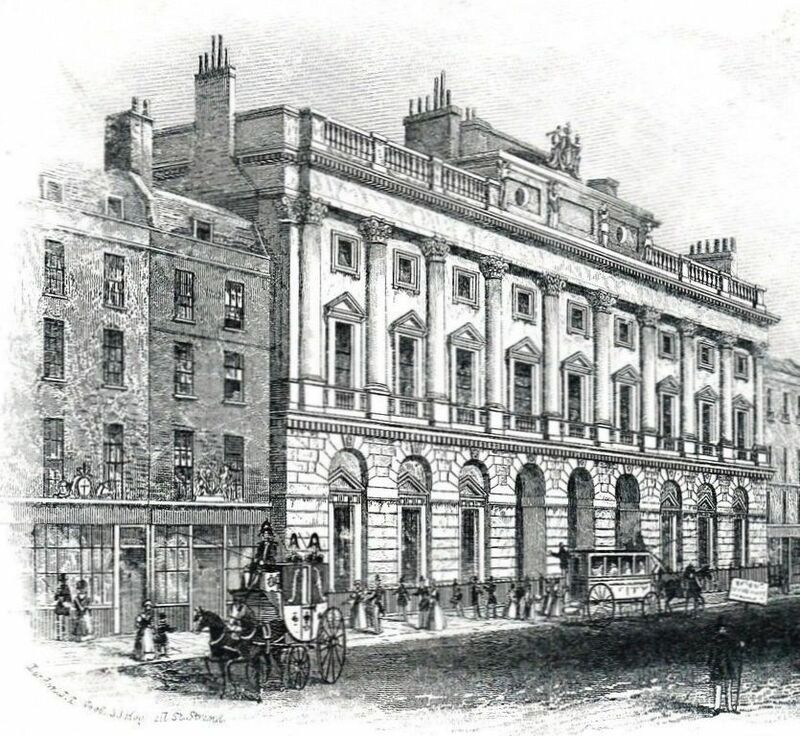 (2) Peirce was to continue the business in the Strand on his own, although he later had another partnership with James Trevelyan Hyde which was dissolved in March 1848. The notice in the London Gazette stated that the firm of Peirce and Hyde had been working as booksellers, printers and publishers. (3) Once again, the business was to be continued by Peirce. Peirce’s wife Susannah died in January 1857 and was buried the 22nd of that month at All Souls, Kensal Green, and George was to follow her exactly one year later as he was buried there on the 22nd of January 1858. His will was proved by his brother, Thomas Henry Peirce, an ironmonger. (6) In October 1858, the “materials of the newspaper and jobbing printing office of Mr. G. Pierce [sic] was sold by auction. (7) Thomas tried to dispose of the lease of 310 Strand (see advertisement below), but he continued to pay the Land Tax up to 1863. In 1864 a William Ponsford took over. 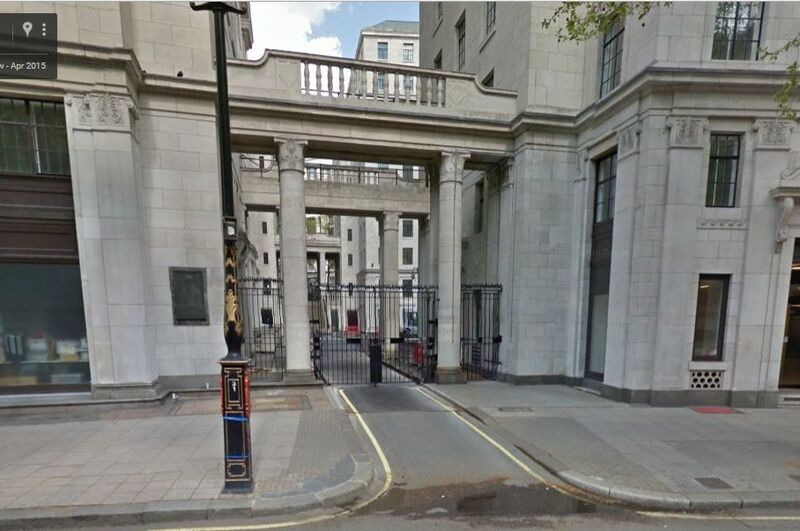 Nothing is now left of 310 Strand as the developments for Kingsway completely obliterated the row of houses behind St. Mary le Strand and where Peirce’s business once was, you can now find a gate between two buildings that – I think – belong to King’s college. And if you position yourself on the other side of the street – roughly at the bus stop in front of King’s College – you will have the same view as Tallis depicted in his 1847 Street View. 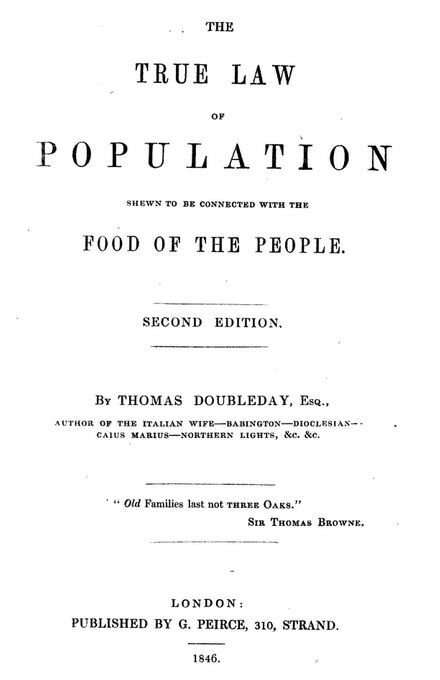 (1) The London Gazette, 24 March 1829. (2) The London Gazette, 27 December 1842. (3) The London Gazette, 7 March 1848. (4) Old Bailey case 718451124-59. (5) Museum of Farnham, Archives, 152/A/12/vi. (6) England & Wales, National Probate Calendar (Index of Wills and Administrations), 1858. The effects were valued at less than £800. 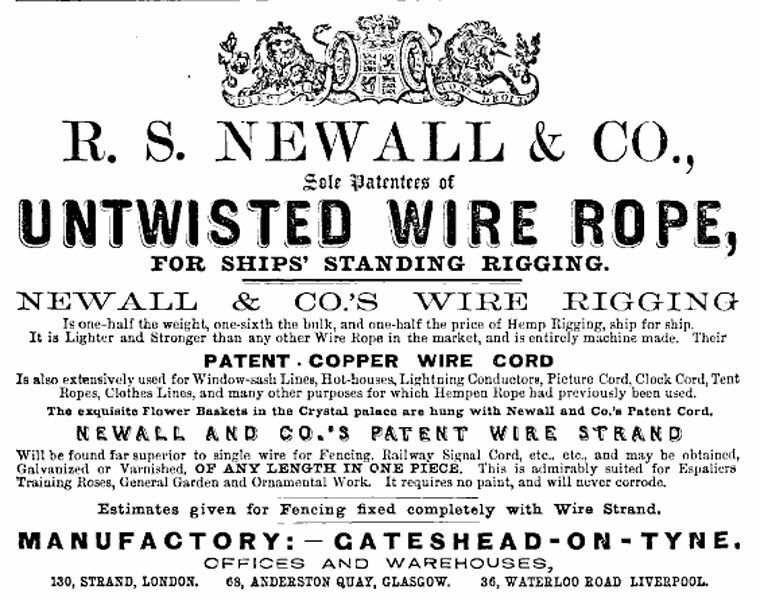 (7) Advertisement in The Standard, 5 October 1858. Street Views: 19 and 10 Suppl. From other records could be added: 119 Oxford Street, and 86 and 95 Strand. There were a few other addresses mentioned in the records for other Baddeleys, but as those are not in Tallis, I am ignoring them for the moment. The next step was to see who lived/worked at the above addresses. It looks as if they can be grouped nicely: Charles senior and heirs at the Strand; John at 48 Oxford Street (he was Charles’s brother); and Charles junior in Fleet Street and 119 Oxford Street (he was Charles’s son). I will give Charles junior and John their own blog posts and concentrate on Charles senior, Ann and William here. 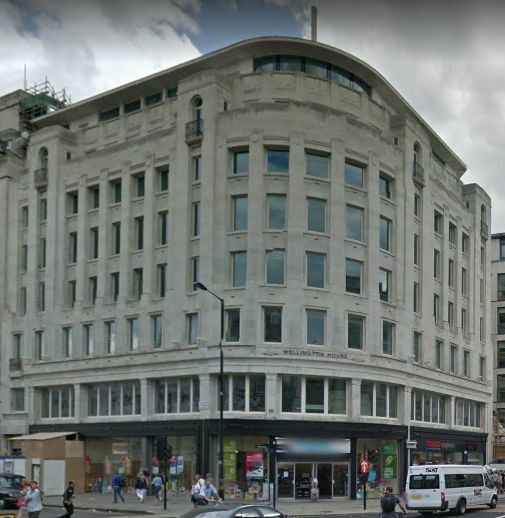 130 Strand was situated on the southern side of the Strand, on the corner of Wellington Street (now Lancaster Place), that is, from 1817 onwards. Before that, Wellington Street did not exist and 130 was neatly tucked between 129 and 131, but when Wellington Street was constructed to become the approach road to Waterloo Bridge, numbers 131 to 134 were completely demolished. The 1815 Land Tax records list George Cross, Durs Egg, a Mr Ottridge and G. Yonge in those four houses, but in the 1817 record, the description is four times “pull’d down”. We have came across Durs Egg, the gunsmith, in another blog post and it is no wonder that he moved to Pall Mall. The demolishing of the houses had everything to do with the Strand Bridge Company who had been granted the right to build Waterloo Bridge and to levy toll on it. The 1818 tax records still show Thomas Alexander, a baker, at number 130, although he had died in 1817. The 1819 records lists Charles Baddeley who had moved from number 95 where he had been working from 1806 onwards (before 1806 he had been at 86 Strand). 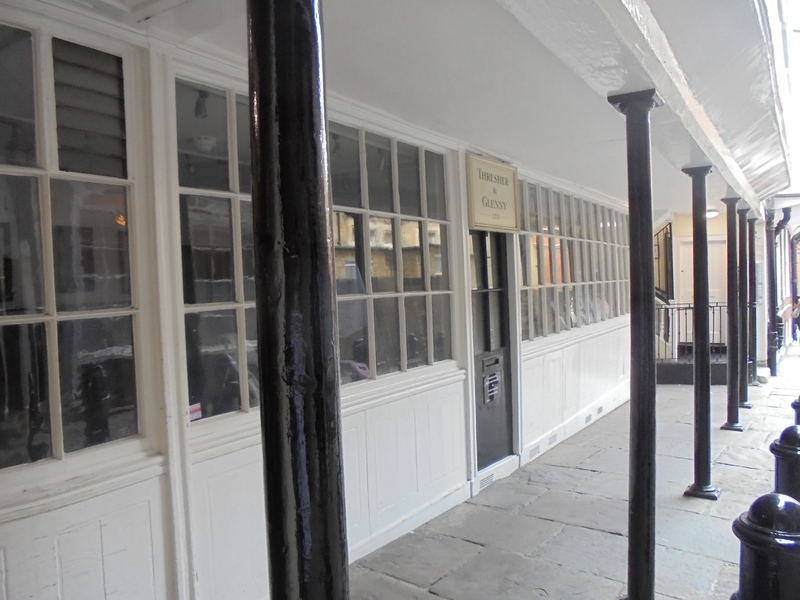 Because the neighbouring property was pulled down, number 130 needed a new side wall and when Baddeley moved in, he not only had more space than in his old premises, but also additional shop windows on the Wellington Street side. 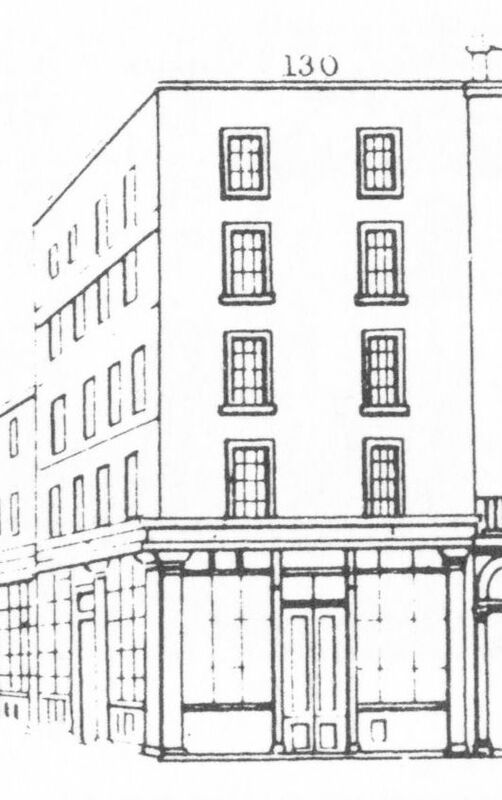 elevation in the 1847 Supplement. Notice the change in the position of the doors as compared to the elevation shown at the top of this post which dates from 1839 or 1840. The whole area must have been a hive of activity between – roughly – 1810 and 1835, and not just with the Waterloo Bridge construction. 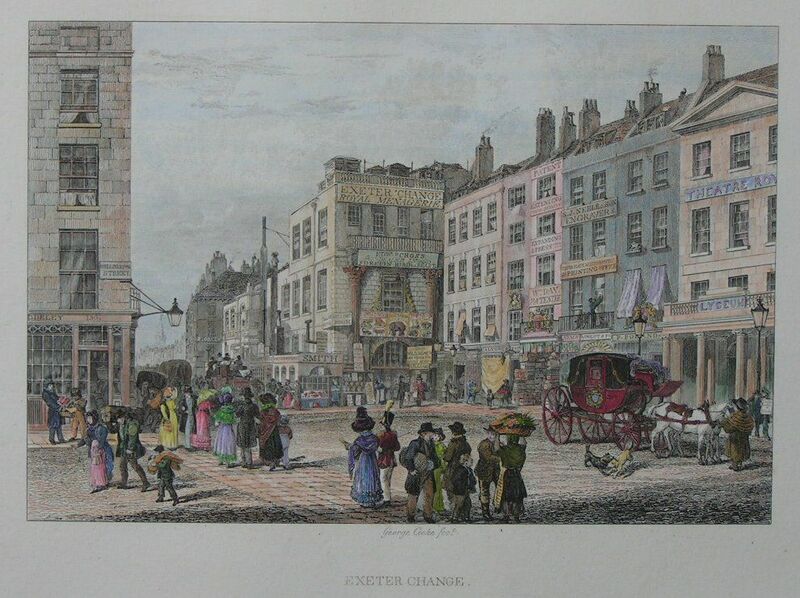 In the Strand, just around the corner from Wellington Street, the Exeter (Ex)Change could be found, a building that had served various purposes over the years, the most interesting perhaps as a small zoo or menagerie (see for a poster of Pidcock’s menagerie here). 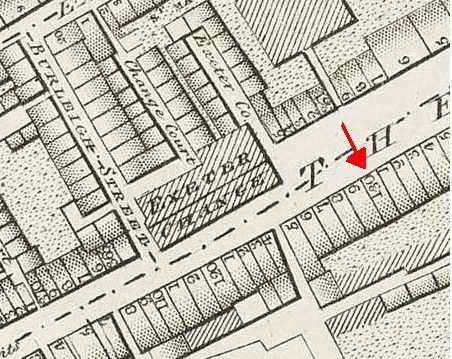 As you can see in Horwood’s 1799 map above, the building jutted out into the street, hampering the flow of traffic and it was finally demolished in 1829. The building has been depicted several times from the same viewpoint, but the illustration below by George Cooke included just a tiny bit more of Baddeley’s shop than the other pictures did. On the left-hand side, you can just about see the number 130 and the last letters of Baddeley’s name. Ann died in early 1858, 84 years old, and was buried at All Souls, Kensal Green. Her address is given as King Street, St. Paul Covent Garden, which was where her daughter Caroline lived with husband Alexander Moffatt. More on the double link between the Cordell and Baddeley families in the post on JohnBaddeley. Nothing is now left of 130 Strand as Baddeley knew it. These days, the whole block is covered by Wellington House which was built in the 1930s. (1) Act 1 and 2 William IV, c. 29, public. 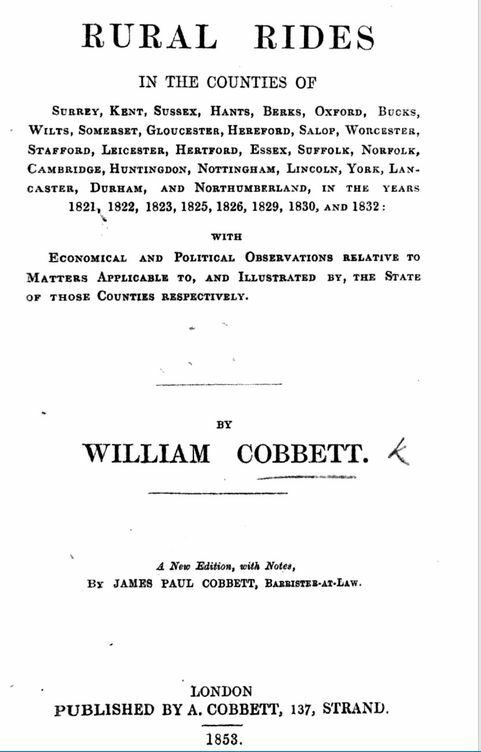 See also Survey of London, vol. 6 and the article on the Arthur Lloyd website (here). (3) They were all baptised at the Baptist chapel in Keppell Street, Russell Square: Thomas 1793, Emily 1795, Mary Ann 1797, Ann 1798, Charles 1800, Caroline 1802, Elizabeth 1804, Eliza 1807, Frederick 1808, Henry 1810, William 1812, Edward 1815. Street Views: 28 and 10 Suppl. And now for a bit of confusion over the shops as it turns out there were two John Threshers. 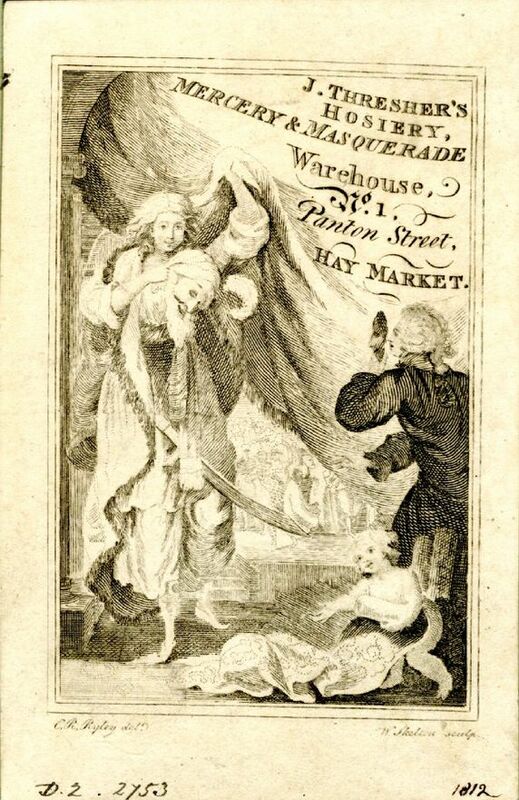 Until his death in 1835 another John Thresher had a shop at Panton Street, Haymarket, especially geared to the theatre world. It may have belonged to Richard Thresher as there is a memorandum of an agreement in the City of Westminster Archives, dated 1795, about the sale of the lease of 1 Panton Street and the sale of fixtures, furniture and stock by Charles Shuile to R. Thresher. The tax records for Panton Street show John Thresher’s name from 1801. 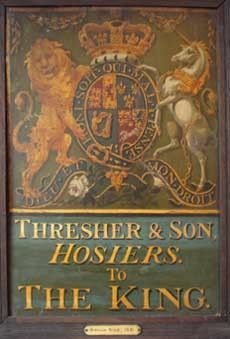 Kent’s Directory of 1823 duly lists that John as hosier & mercer at 1 Panton Street, but for 152 Strand, they have Wm Threasher [sic]. 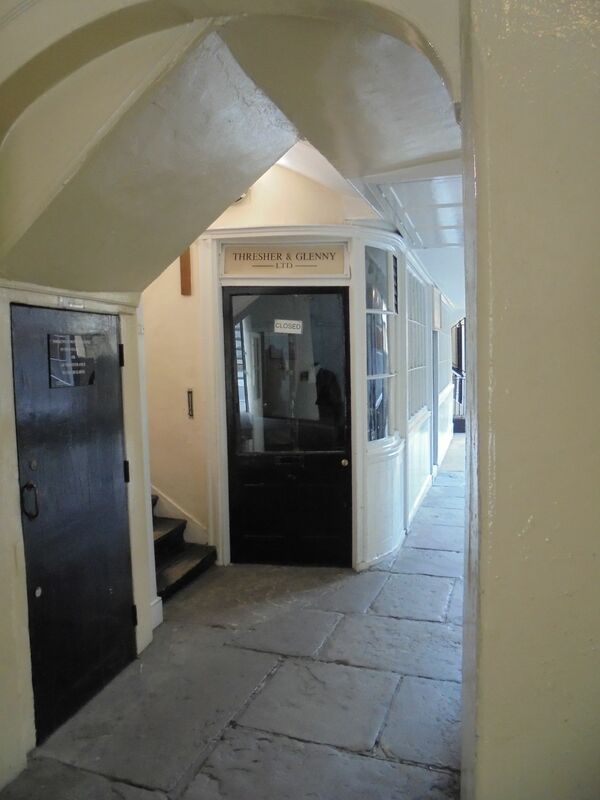 The John Thresher of Panton Street died in 1835 and left most of his estate to his daughter Ann who is also named executor together with friend George Miller. The executors duly insure 1 Panton Street with the Sun Fire Office, but the business is not continued as a Thresher shop, but taken over by John Brumby, a bookseller. In John’s will of 1835, he makes no mention of the shop in the Strand, nor of the people running it, which may very well indicate that he had no stake in it. It is possible that the John Thresher of Panton Street was Richard’s son and the John Thresher of the Strand was his nephew. The entry in The London Gazette about the end of the partnership of Richard with Miller clearly states that Miller and John Thresher were Richard’s “nephews and successors”. 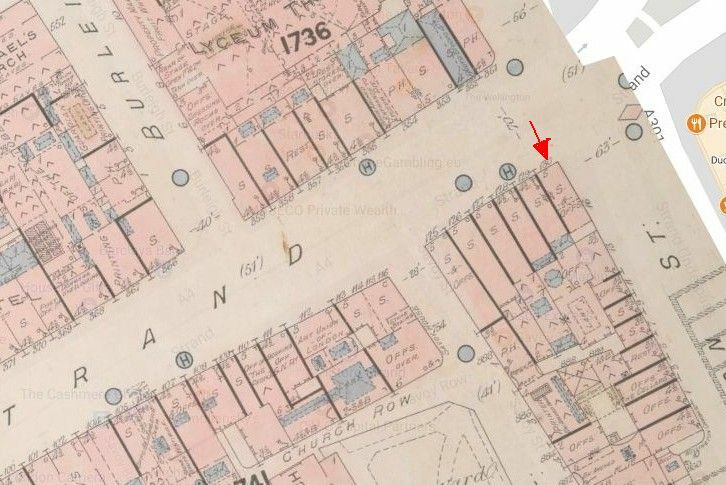 According to a 1846 document in the Westminster Archives, Thresher and Glenny applied to the Metropolitan Board of Works for permission to make openings in the party wall in order to connect the two properties of 152 and 153 Strand. 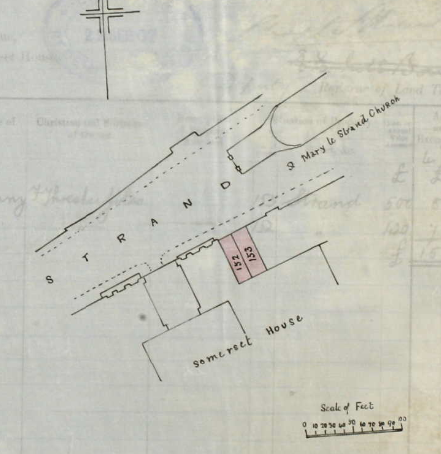 The 1851 census does list 152 and 153 Strand together as the abode of John and Henriette Glenny. Also living with them is apprentice Frederick Giles, who was the son of Somerset farmer and maltster James Giles and his wife Elizabeth Thresher. I do not know how Elizabeth was related to the Threshers of the Strand, but as the name is unusual, there must have been a family link between Frederick and his employers. Although number 153 had been added to the living space of the Glennys, the tax records continue to list number 153 for Philip Firmin. In 1860 Firmin takes over number 154, but he still pays the tax for 153 until 1877 when the situation changes. Firmin is from then on still listed as the occupier of numbers 153 and 154, but Glenny is now listed as the proprietor of 152 and 153 and the occupier of 152. More on Firmin in a later post. Glenny, by the way, not only expanded the shop, but also the items on offer. In 1854, for instance, he introduced a portable camp bed for which he received a patent. 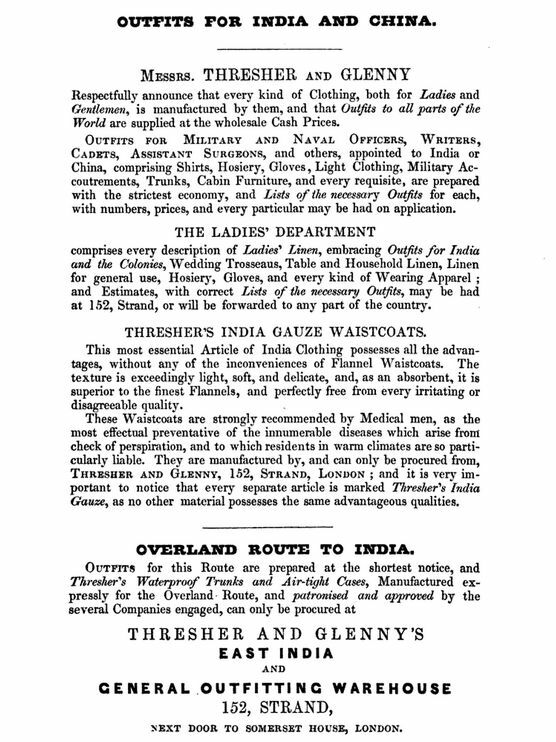 At roughly the same time, Thresher’s branched out into military uniforms, perhaps not such a great leap as many of the travellers to India were or had been military personnel. 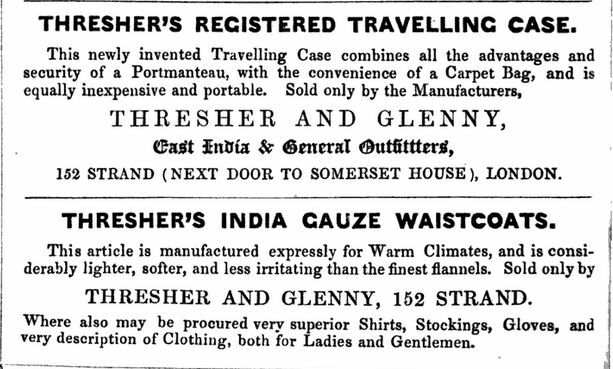 At some point John Glenny went into partnership with Frederick Thresher Giles and after John Glenny retired in 1876, Frederick entered into a partnership with Henry John Glenny (John’s nephew), which lasted until 1902. (8) The mortgage of the lease and the goodwill of the business were then transferred from Glenny to Giles, although the name of the business remained Thresher & Glenny. The property at 152-153 Strand looks rather sad these days, but then, it is no longer in use as a shop by Thresher & Glenny. Plans to destroy the houses at 152-158 for a development by King’s College have been averted – hopefully permanently – and Save Britain’s Heritage has produced an alternative plan, see here. 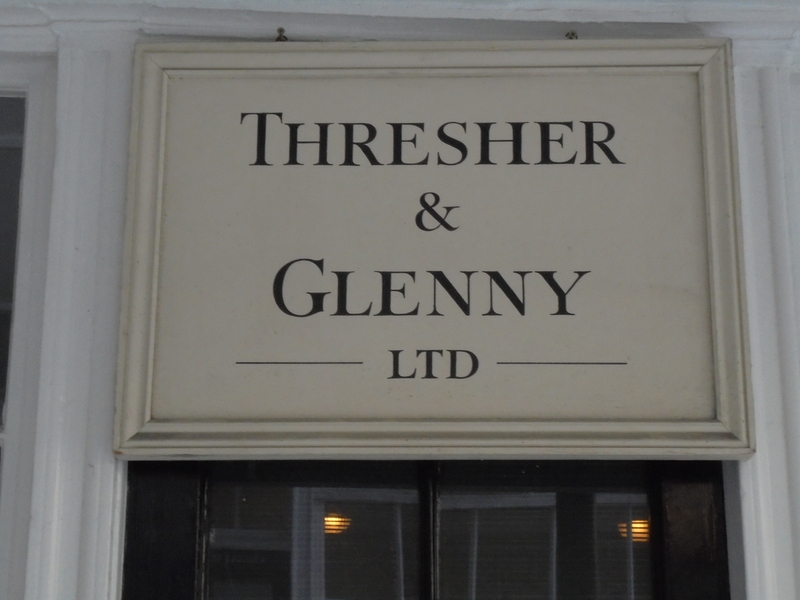 Over the years, Thresher and Glenny had shops at various London locations (see Wikipedia), but since 1992 they have been trading from Middle Temple Lane, so only for a short period in the long history of the firm, but it looks as if they have been there for centuries. The outside of the building is like a time capsule and gives us a good idea of what an 18th or 19th-century shop might have looked like. Thresher & Glenny are still going strong, albeit no longer under family management. The last of the line to work in the business, Charles Frederic Glenny, the son of Henry John Glenny, died in 1967. (1) According to Thresher & Glenny’s website. Wikipedia gives 1755. (2) The London Gazette, 12 January 1805. (3) The London Gazette, 27 January 1816. (5) The London Gazette, 14 January 1840. (6) It has been suggested that Henriette Jane was Richard’s daughter, but that is not correct. John clearly mentions Henriette Jane Glenny as his daughter in his will (he died in 1846, PROB 11/2030/133). (7) The Magazine of Science, 1846, p. 352. (8) The London Gazette, 2 January 1903.